Texas Nature Challenge is a family oriented friendly competition whose main goal is to get families and kids outside and visiting their local parks, nature centers, and green spaces. At each site, participants complete activity challenges designed for family fun and nature exploration. Join us on an adventure across Texas! Here’s how to get started for families and for participating sites. 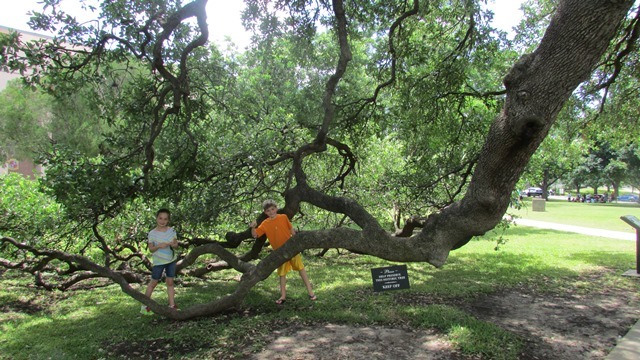 Texas Nature Challenge occurs in several regional areas in the state. During registration, you will choose the region where you live, your home region. You will receive updates and announcements from your regional coordinator about your home region. If you choose to compete you will compete in your home region only. Each Region of the state will begin their Challenge at different times of the year so please check the website for updates on opening and closing dates for your particular region. If you plan to travel to other parts of Texas or want to participate in more than one region, you may also choose other regions and receive updates from those regional coordinators. This is a great way to find out about our wonderful sites in Texas. Check your region page to see when and where this will take place. Check your region page to see the variety offered. You may even want to create your own! Please tell us about your adventures through the website's blog and the Facebook page. Other families love to hear about your experiences! Some regions offer a competition for your scrapbook, nature journal, blog collection, field notebook or other collection. Check your home region site news to see if your region offers the competition. You can be as creative as you like in presenting your documentation. Some families have turned this into a school assignment with a straightforward field journal with pictures and writing entries, others make a binder showing off their work, and others create full scrapbooks of their adventure. 1. Why join Texas Nature Challenge? Texas Nature Challenge is a marketable short term package of activities to strengthen the community of nature sites in a region. Texas Nature Challenge helps families understand that they have choices and helps them learn about the variety of natural resource sites available in their area. 2. Contact your region coordinator. Find out who is leading your region and let them know you’d like to be included. Other ideas have been a photo journey, puzzle, rock ID, etc. 4. Upload your challenge to the website via an online form. 5. Alert staff and volunteers about the Challenge. 6. Offer support to visiting teams. 7. Monitor the Challenge to keep it up to date. 8. How does it work for families? They sign up online for a free account. They find challenges on the website in their region. They visit sites and "do the Challenge." They post about their experiences on the Texas Nature Challenge website or social media. If their region has a competition, they submit a scrapbook about their experiences for a chance to win prizes. 9. What happens when the family comes to your site? They bring the challenge or find a printed one on site. They follow the directions to participate in and experience the Challenge. They keep notes or photos of all the fun and new experiences they're having. They visit other parts of your site and come back another day. We are new to the area. It helped us find it! It allowed us to have a reason to look forward to going to new outdoor places and gave us something fun to do when we got there. Our goal is to visit all sites for the next challenge as each provides excellent educational activities for the entire family. We had been to a lot of the places before, but it gave us a chance to explore things a little deeper.